WHT: You are not a native Greenvillian, correct? David: I am from the East Coast in general. I was born in Maine, but spent most of my formative years in the panhandle of Florida and a brief stint in Virginia before coming to SC. WHT: But you are living here now? David: Settled in Greenville…for the time being. WHT: Favorite thing about Greenville? David: Small enough to retain an intimate feel, diverse enough to have something for everyone. WHT: Are you working elsewhere in the city…other than your acting gigs? David: By day I currently work in sales/account management for a company that manufacturers and distributes bulk customized apparel and promotional materials. If you ever are seized with the desire to purchase a thousand coffee mugs with your face printed on them, just give me a call. WHT: How many shows have you done at The Warehouse? David: Streetcar is my second, but I’ll double that number by the end of the season! WHT: Let’s talk about Streetcar for a moment. Did the iconic film version of Streetcar affect your research / performance / choices, etc. for this role? If so, how? David: Although I’ve seen clips, I don’t believe I’ve seen any parts of the movie that Mitch is in. I did run a quick image search to see how Karl Malden combed his hair for the role. WHT: How much does the scenic, lighting or costume design influence your performance / interpretation as an actor? David: Although I greatly enjoy finding the inner life and brain of a character through the early portions of the process, I find that it’s not until the costumes, lights, and sets are in place that I can really start to breathe as the character. WHT: You have a favorite moment from Streetcar or the rehearsal experience? David: The first time we rolled through the show from start to finish in the space in our final technical rehearsal. Streetcar is a beast of a show, and even though we stumbled through it, seeing that beast come to life for the first time is always magical. WHT: What’s it like to present a non-Christmas show at Christmastime? David: I’ve heard nothing but positive comments from folks who appreciate something a little more down-to-earth amidst the glitz, glamour, and sappiness that so often pervades the season – not that there’s anything wrong with any of that (I’m not a Scrooge, really), but I’ve found that a study in contrasts can deepen an appreciation of both ends of the spectrum. WHT: What is your favorite role ever? David: My two favorite roles share the same first name – it’s a toss up between Dan in Next to Normal at Centre Stage in 2013 and Daniel Kaffee in A Few Good Men there earlier this year. Next to Normal was personally stretching in a variety of ways and A Few Good Men was just good old-fashioned thrilling courtroom drama. Not to mention that as Kaffee, I never had the opportunity to get bored backstage waiting for my next scene! David: Everyone and everything at WHT is just first-class professional grade – when you have an organization that attracts dedicated, hard-working people – excellence prevails. WHT: Person that you haven’t worked with that you’d most like to work with on a show? Why? David: Sir Ian McKellen. Because he’s Sir Ian McKellen. 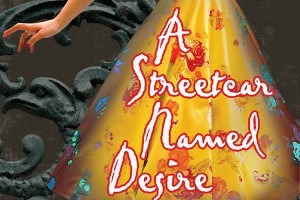 WHT: What’s your next theatre gig after Streetcar? David: I’m blessed enough to have two more shows at The Warehouse Theatre this season – Richard III and Boeing Boeing. WHT: Piece of advice that you’d like to give an audience member coming to Streetcar? David: No matter what your opinion is on each of the wonderfully and tragically flawed characters that Tennessee Williams has given us in Streetcar, look for the humanity and vulnerability in each of them – and you might be able to find your own a little better along the way. Catch David Bean as Mitch in A Streetcar Named Desire playing until January 10th!